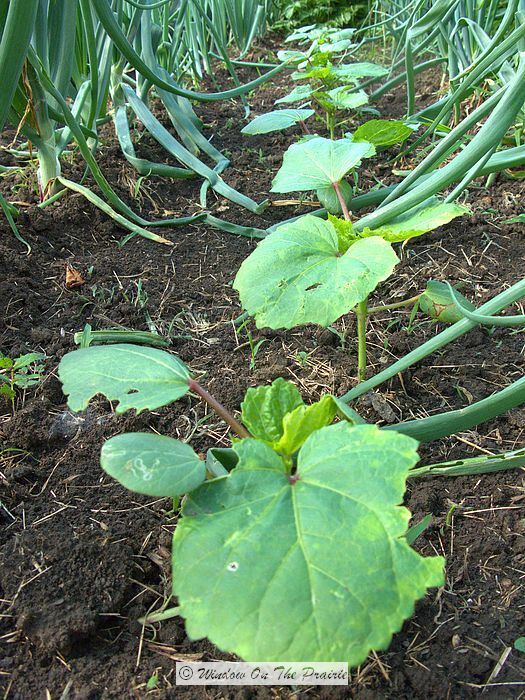 On May 24, I planted okra in the garden. Since then, it has grown… a lot. Here it is today. It’s up to my chin, and looks like a row of trees in the veggie garden. Animals take shelter in its shade. I had to shoo a couple of lumberjacks out of it yesterday who wanted to cut it down with their chainsaws. Hawks perch at the top of the plants looking for small prey in our yard. You get the idea. It’s big. It started blooming last week. And it has very pretty blooms too, about 3 inchess across with a burgundy center. And then it started making little pods. Finally, my dream of fried okra can become reality. This recipe is very flexible. 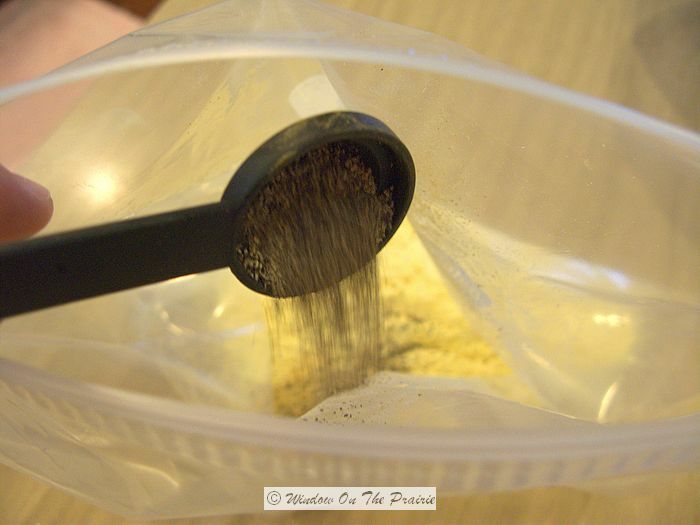 You can use regular salt instead of the seasoned salt, or onion salt or garlic salt, whatever. You can also add more seasoning, or use less. 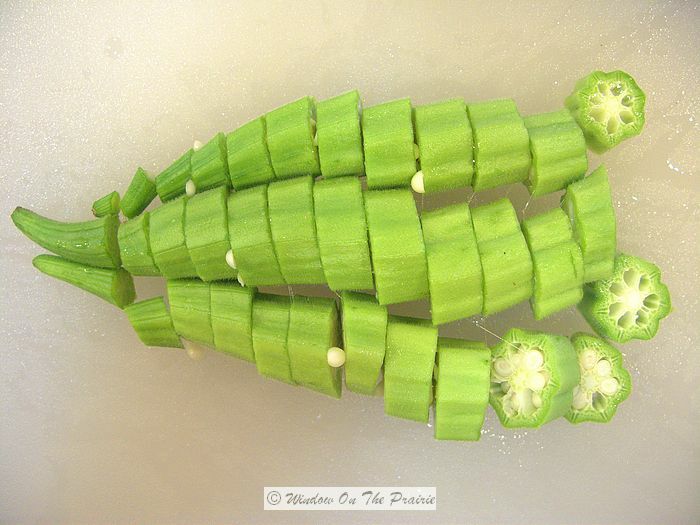 Wash the okra, cut off the ends with the stem, and then cut into 1/4 to 1/2 inch slices. Look how neat it looks on the inside. Kinda pretty. Shake the bag to mix up the ingredients, and then add the okra. Close the bag, and shake it up. Stir well to coat the okra on all sides with the butter. Reduce heat, about midway between low and medium heat. 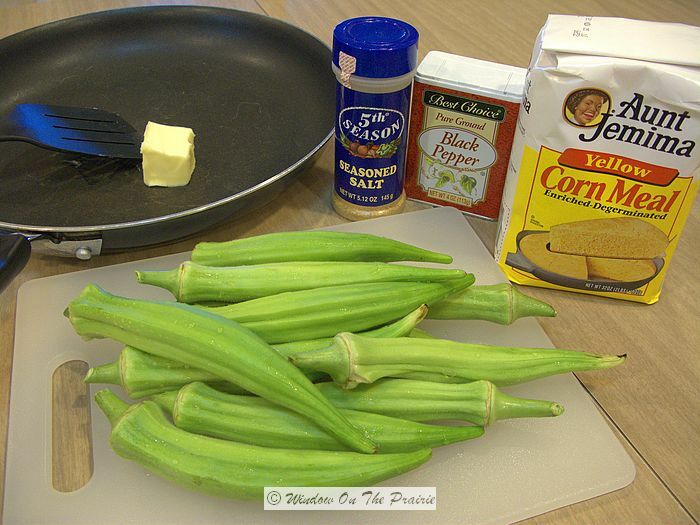 You want the okra to fry without the butter scorching. Turn okra occasionally to fry evenly. When it is lightly browned, and looks like this, it’s done. Dig in, there’s more where that came from. 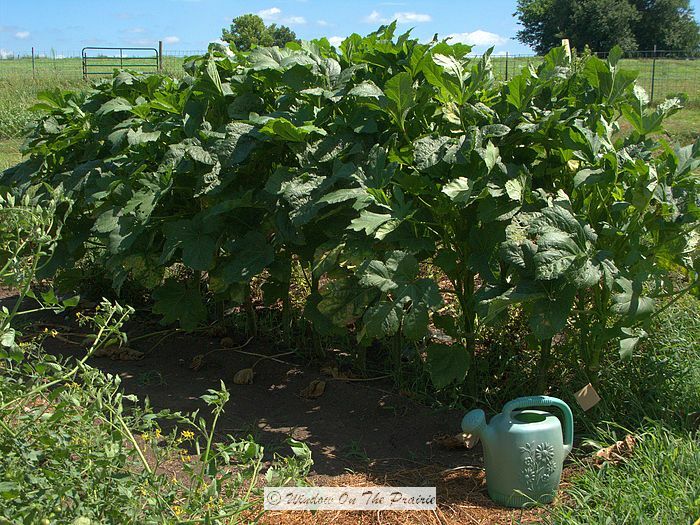 Okra produces until frost, so there will be a lot of fried okra to be had between now and then. Tomorrow’s post is a surprise. In fact, even I don’t know what it will be about. Stay tuned. 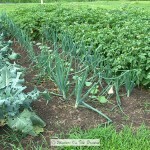 This was the first year that I had tried to grow okra–it has done well!! 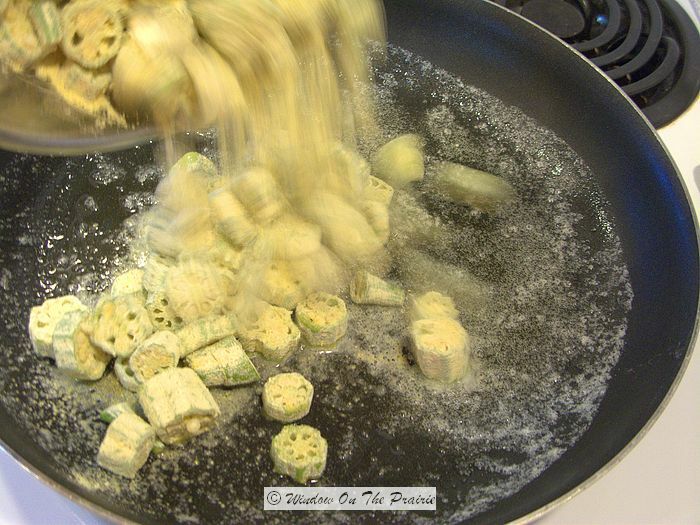 We enjoyed fried okra last week on our lake adventure–and about 3 weeks ago I tried pickling some. We tasted that last week too–It was actually quite good (from someone who can’t make pickles to save her LIFE!!) 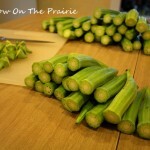 I didn’t realize that it would make so MUCH okra–seems like I will be making LOOOOOOTS of pickled okra before frost!! But with all the kids, I doubt it will last very long! Enjoy yours! Do you ever freeze it?? This is the first year in a long time I’ve grown okra. I may have to freeze some too- never done it but I know it can be frozen. hmmmm. I know what I’m planting next year, better clear a big area for it! 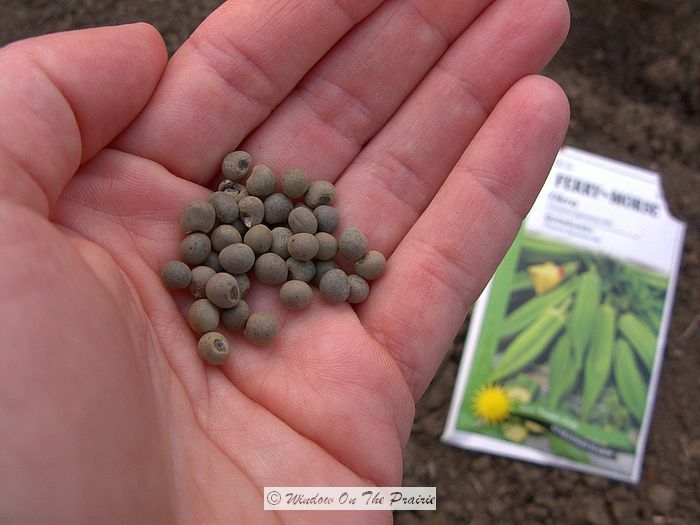 Does that seed packet have a certain “name” on it? I love it plain as well! It’s the Clemson Spineless variety. I’ve always had good luck with this one. I’ve tried others, and was disappointed. I can never get tired of eating okra! Your recipe looks good. I must try it. Please do, and let me know of your favorite way to cook okra. Ok….I will give it a try. This will be my second time ever eating okra. I know that people who love it, really love it. I hope I can find okra at the farmers market. If I find it, I will definately buy it and try your recipe. I am looking forward to it! I’ll let ya know how it turns out. Wish I could send you some. We’re going to have plenty to share in a while. I have to admit, I’d never tried okra until this year, and I have been having fun experimenting with it. What is your favorite way to cook it? This looks wonderful. 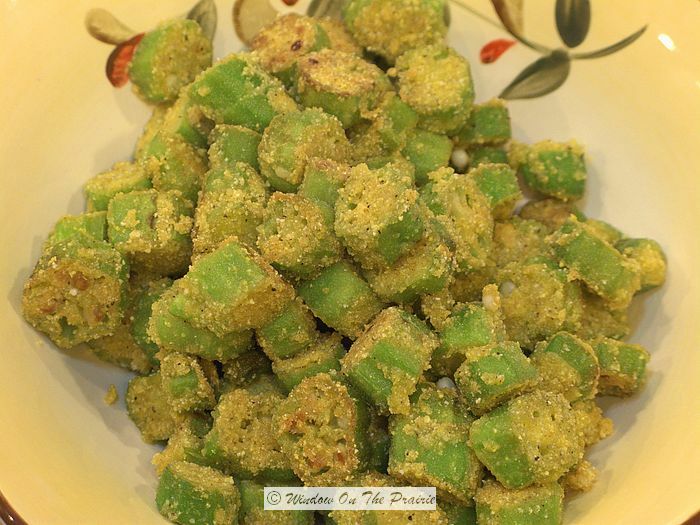 My husband loves okra and would me to make this. I remember his parents planting okra one year. It turned into a tall okra jungle. 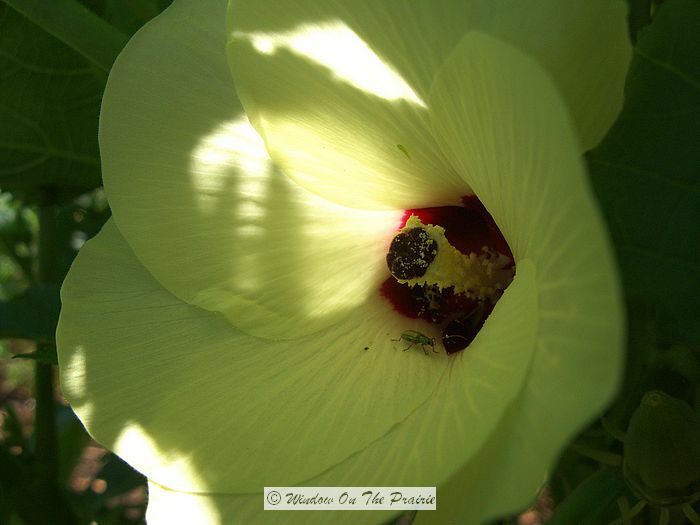 I remember how both beautiful and fragrant the okra blossoms were! Thanks for sharing! I’ve never smelled the blossoms before because that would require me sticking my head inside the jungle, but I’ll give it a try. From such a little seed, too! 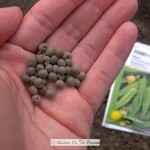 Makes you think of the mustard seed, smallest of seeds, largest of plants …..
I’m from the South and adore fried okra and have never cooked it … and going to follow your directions and give it a try! Thank you! I thought of that too, a small seed becoming such a large plant, like the mustard seed. 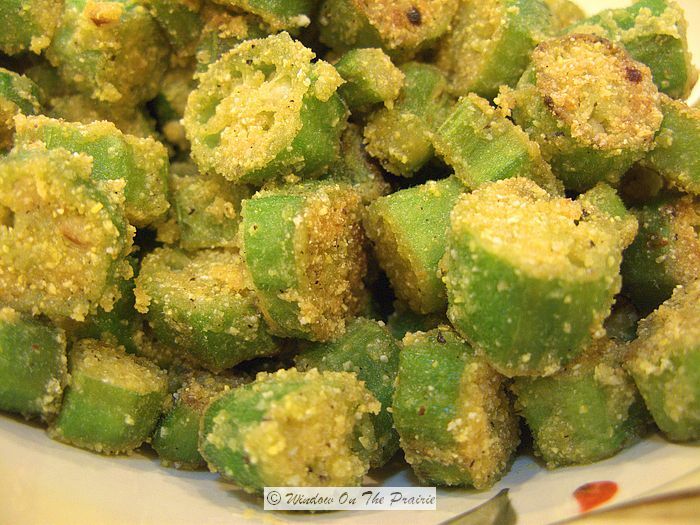 Do try the fried okra, it’s so easy. I often make a dish called “Raita” which is fried okra with seasoned yogurt dressing. First I make the yogurt dressing by whisking together 1 cup of plain yogurt, salt to taste, ½ tsp sugar and a dash of cayenne. 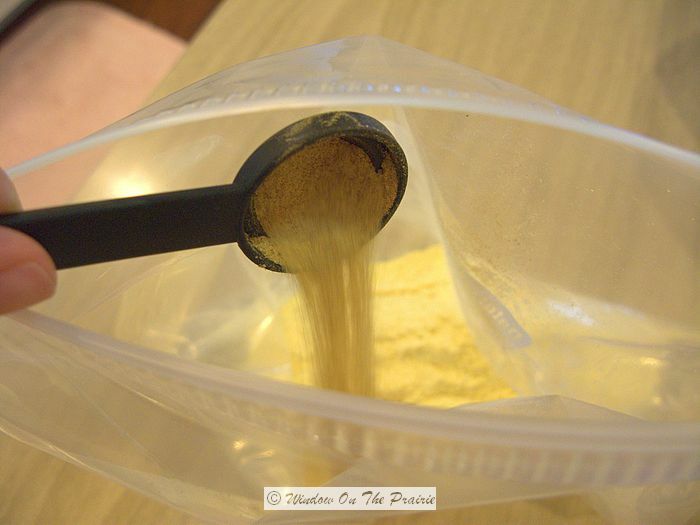 (adding ground cumin ¼ tsp is optional). Refrigerate for 30 minutes. Next I dice about a dozen okras into ¼ inch rounds (The okras should be wiped dry before dicing because water makes them more slimy). Toast them on a hot skillet till the edges begin to char. 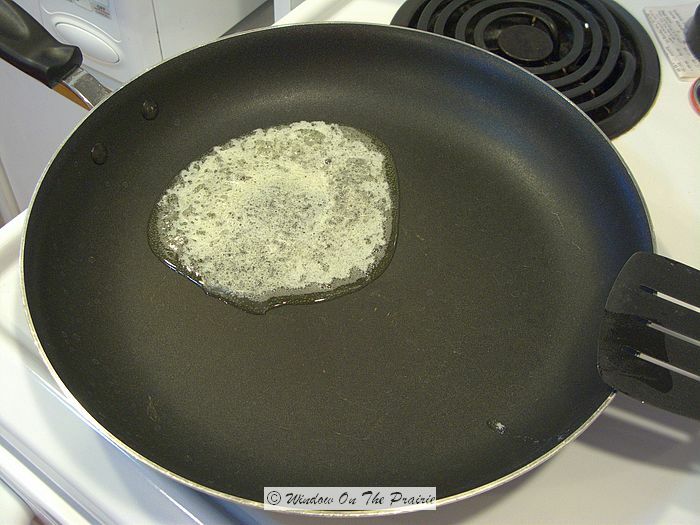 Heat 1 ½ tablespoons of olive or any other oil in a skillet over medium heat. To the hot oil add the toasted okra rounds, toss, and let sizzle until crisp. The okra will be green-brown at this stage. Remove it to a paper towel. Add the crisp okra to the seasoned yogurt and serve immediately. Slurp! And I also make some hot and spicy curries with okra. Sounds yummy. I’ll have to give it a try. 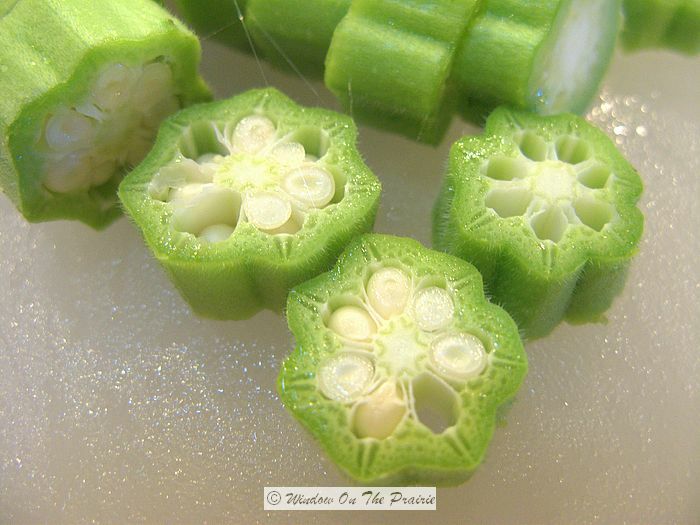 I’ve never had okra… but it certainly looks yummy! Do give it a try sometime. It really is good. 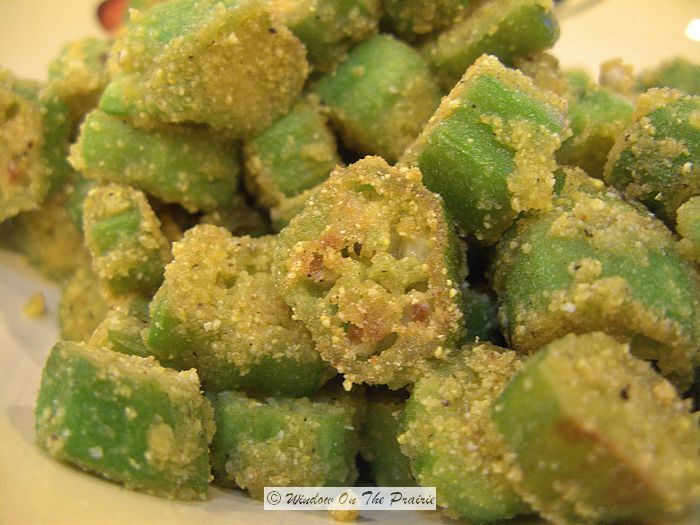 I love fried okra, but rarely get to have any! 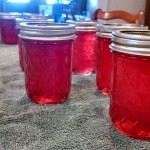 I will look for some at the Farmer’s Market next week, and try your recipe! Thanks! I came to find your peach pie recipe and saw this — a must have any time my husband and I find it on the menu. When I see this I miss my garden! Thanks for a great recipe and a reminder I can do it myself. Do try the recipes, and let me know how they turn out for you! So glad I found it! Thank you New West Gal! Looks delicious. Will certainly try this recipe. I only use salt and no spices or corn flour or pepper. WOW Suzanne! From seed to finished product, very cool! I have enjoyed meandering through your days! Thanks for sharing with us! PS: Kitty sends her regards. Oh Suzanne, we love okra and just the way you prepared it. Thank you for sharing your photos from the okra plant. I just discovered your site and love it so far. I live in Texas, and okra is a staple. We eat it fried, but with slight differences from your recipe. We eat it younger and smaller; if it is at all hard, out it goes! 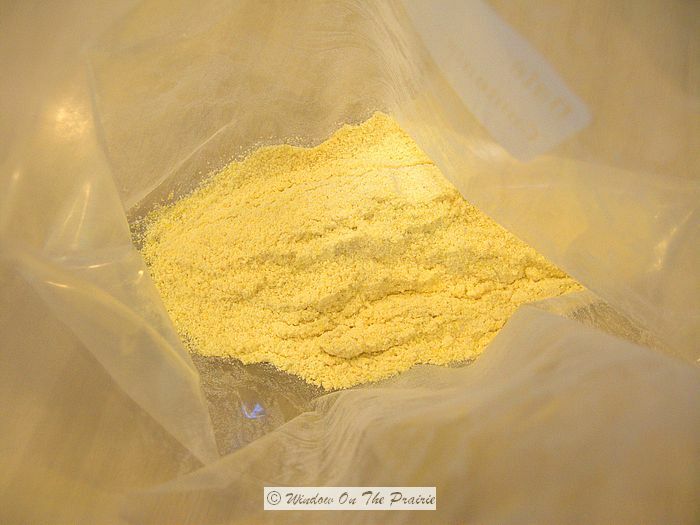 I just roll it in corn meal and a little salt and fry it in oil till browned and crispy. Our favorite way to eat okra is in what we call gumbo, although it isn’t actual cajun gumbo. I just brown ground beef and chopped onion, drain any fat off, add tomatoes, either canned or fresh, and sliced okra, plus garlic powder, salt, and pepper. Simmer till it has time to get juicy and flavorful, (add a little water if needed to make it juicy), and serve over rice with cornbread. YUM! You can add corn to this, too. I can quarts of tomatoes, onions, and okra, then all I have to do is brown some ground beef, maybe a little fresh onion, and add the canned vegetables, and salt, pepper, and garlic powder. 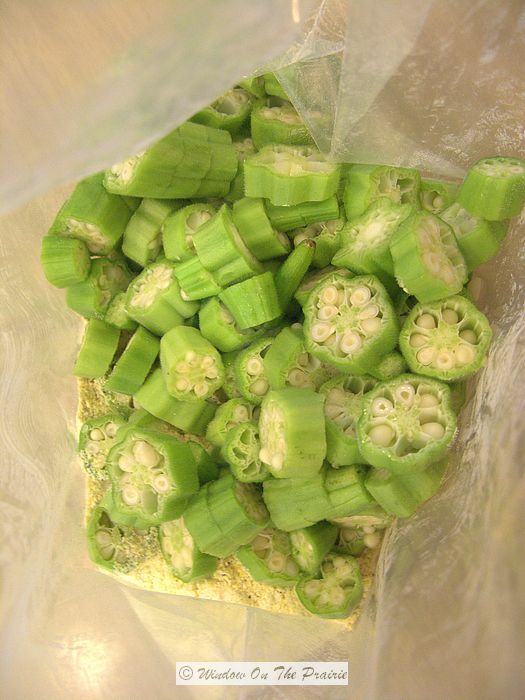 I slice okra and freeze on a cookie sheet, then pour into a freezer bag to use in soups, gumbo, etc. It is great in soup. I also like small pods just boiled until tender as a side dish. They can be frozen whole. I don’t blanch. Thank you Mary Jane for sharing your gumbo recipe. Sounds so yummy! Never thought about cooking little pods whole – great idea! I love love okra. I am from Okalahoma, so its a okey thing. I always deep fry mine. My mother fryed it too like you do, but a little more LARD, made it yummy. 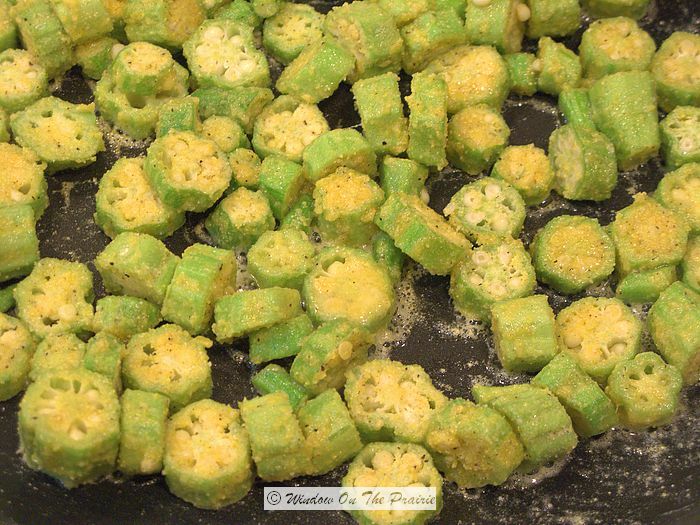 Hi Suzanne: My parents were raised in the south so fried okra was on our table often as was fried yellow squash. My dad was the first to grow okra in our NE Kansas hometown in the late 60s. While visiting Silver Dollar City years ago, my husband & I experienced a wonderful meal that included okra. They had an outdoor, giant skillet where they served a medley of fresh vegetables mixed with chicken or smoked sausage and I believe they called this dish Southern Succotash. The workers fried okra, yellow squash, onions, potatoes, fresh corn and chiken and smoked sausage on this giant skillet, then mixed them together. 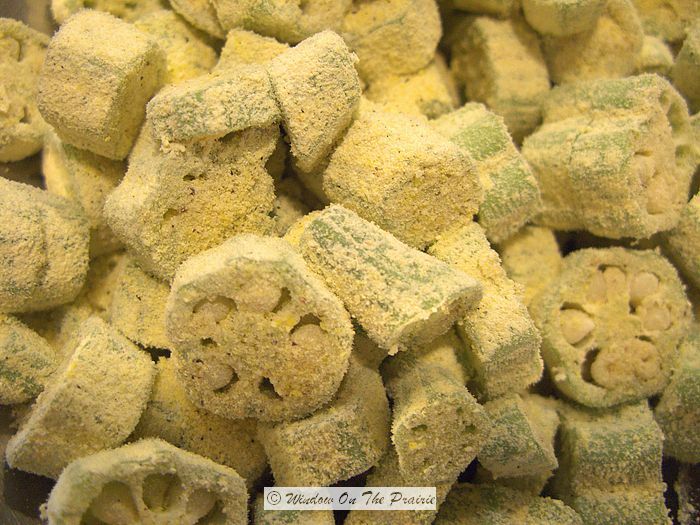 The okra and squash had been rolled in cornmeal. Oh so good! I’ve made this at home a time or two, the flavors just mix so well and its great as a leftover the next day. Give it a try! I didn’t get any okra planted this year so made the dish with frozen,unbreaded okra from the store. 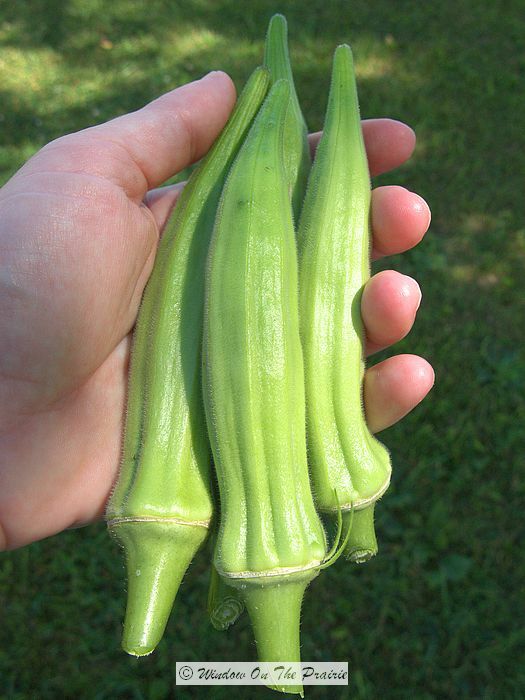 Okra is also excellent thrown into homemade soups, it adds just the right amount of thickening. Mom also would stick a few small pods in a pint of blackeyed peas. Wow, that does sound good. I’ll look for a recipe. Thanks!